How to Install Metal Roofing? The subject of metal roofing is a topic involving many details, which can be specific to the variety of metal roofing systems that are available. To complicate things further; there are many different gauges of metal roofing, and a myriad of metal choices ranging from aluminum to steel, and to leaded copper and zinc, as examples. In the context of installation; the subject can be further categorized by metal roof systems which are manufactured for residential applications primarily, and those that are designed for commercial building application. The question we are often asked in the roofing industry is: “is metal roofing a good choice for my home”. The short answer is yes. A more complete and honest answer, is if the metal roofing assembly is installed with design considerations that account for potential condensation issues, future serviceability, and with accounting for the specifics of the building envelope over which the particular metal roofing system is to be installed. Opinions on the suitability of a particular type or brand of residential metal roofing will vary from one contractor to another. Obviously those promoting a particular type of metal roofing product will say theirs is the best because…. so we will frame the discussion by noting some points which few involved in the industry would disagree with. Manufactured, ribbed panels are widely available through proven manufacturing companies that have a long track record in North America,for producing, and standing behind such products. Brands such as Vic West, Ideal Metals, Englert, are examples of such firms that manufacture various profiles and gauges, and colours, of panel steel. Everything from ribbed panels, to box batten profiles are choices readily available. Certain manufacturers also supply equipment that contractors can use to roll panels out in the field of a job. Advantages of these types of products include the fact that panels can often be designed to run from ridge to eaves, thus eliminating horizontal seams in many job applications. Such manufacturers also have the necessary accessory materials such as drip and rake edge flashings, valley metal, closure trims, etc. These manufacturers create profiles which are used in commercial applications very typically for roofing and siding, and have residential grades available also. In the context of residential application; such profiles often suit modern architecture or rustic architecture. Standing seam metal roof panels can be obtained from the large suppliers discussed, but are also available from skilled contractors who fabricate panels using flat stock sheet metal, copper or leaded copper. If you think of domes on churches or heritage buildings from before the turn of the previous century; such work was and is, handcrafted today by copper smiths and metal mechanics who are skilled in the art. Such work tends to be custom in nature, and is more often found on residential or institutional projects. Skills involving soldering, hand seaming, complicated math, and years of field experience; translate into an artisan result which endures for decades. The cost is commensurate with the knowledge, skills and effort to complete such work well. 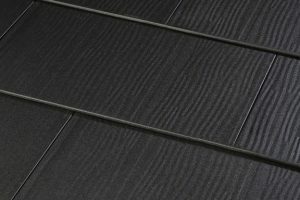 Stone coated steel tiles are becoming more popular for residential applications, with one brand being dominant in the industry, and with a handful of similarly styled products being manufactured by others. The original product has been in our eastern Canadian market for over twenty years, and has demonstrated reliability. The installation of such products are within the realm of what an asphalt shingle roofer can install, provided they have been trained on the specific detail requirements of the manufacturer. Installation costs are reported to be anywhere from 50% to 100% more expensive than average grade asphalt shingles, depending on the height, complexity, and access of a particular roof. Such products often simulate the look of a higher quality fibreglass laminate shingle. A possible drawback, can be surface granule loss over an extended period of time; albeit many years, that can result in an appearance issue. Aluminum roof panels which simulate the look of slate or shakes, can be an option within the price realm of stone coated steel. Such products which are designed with side hooking, lap seams (necessary to inter-connect with one another); can perform well as long as they are not stepped on. Roof traffic such as chimney cleaning, has demonstrated the vulnerability of such a product; as a crushed down panel may open up at a side lap seam, and allow water ingress, or can result in water tracking sideways. To repair such a roof then involves disassembly of the area, typically back down to the eave of the roof, to correct the damaged piece or pieces. With respect to the metal shingle/shingle panel industry; it is important for the consumer to verify that the manufacturer and installation company are financially stable. The history of such industry is that some providers don’t survive in business. This could also be said of the roofing industry generally. Because it is a large investment relative to asphalt fibreglass roof shingles; sales of metal roofing in Canada is a fraction of the total sloped residential roofing industry; albeit they are gathering favour from people who feel they are an achieving a “lifetime “ roof. (If there is actually such a thing). 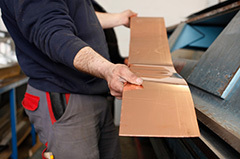 Some metal shingle installers promote the installation of such products over an existing asphalt roof. There can be debate as whether the practice is sound. Pros are that it reduces the labour costs to remove and dispose of existing roofing materials. Cons are that on older housing stock, the opportunity to address deficient decking, or undulation of the roof deck, bowed rafters etc.. may be overlooked. The method of overlaying on top of existing shingles, is promoted by some sellers as a method for dampening noise levels during heavy rainfall. With any type of metal roofing installation or retro fit, certain design considerations should be taken into account. Primarily they should include design elements for mitigating condensation when installed on a heated structure, meeting wind uplift standards, and serviceability for future maintenance. Another consideration can involve sound dampening, if one is concerned about noise during heavy rain events. Some may people may view it as charming, and some highly annoying. Certain types of metal roofs, installed on steep slopes, particularly need to account for shedding of snow and ice in winter conditions. The integration of snow guards and or rail systems to prevent dangerous run-off, should be a primary consideration in such areas that experience winter and where pedestrian traffic could be at risk. It is often recommended to have lightning rods installed on metal roofing projects. These are commonly utilized on churches, tall buildings, and buildings located in open spaces such as in rural locations. Proper grounding of lightening rods directs electricity into the ground to mitigate fire risk and dangers of electrical strike. A specialist in this field is required to design and complete such work. It can be a wise practice to have an engineer, or a roofing/ building science expert, inspect existing conditions within an attic prior to specifying and installing a metal roof system. Determining proper intake and exhaust venting of the roof assembly is critical. Also; examination of the type and level of insulation within the attic space, along with determining issues of heat loss; such as where top plates of walls meet roof trussing. Items such as holes where pipe protrusions exist, exhaust from bathroom or kitchen fans etc., humidity levels inside the building, etc. ; all need to be considered to do the best job. Ideally a “cold roof “ assembly is best; which allows a sufficient air space beneath the surface of the metal roofing;particulary on such applications as vaulted/ cathedral ceilings, and interrupted attic spaces. This would permit insulation of the complete rafter spaces below the cold roof. Removal and disposal of the existing roofing and flashings to expose the bare substrate. Inspection and repair of deficient decking, rafters, or pronounced roof undulation. Installation of ice & water membranes at roof eaves, valleys, and perimeters of roof appliance areas. Installation of a synthetic underlayment, asphalt felt, rosin paper (depending on application); over the surface of the roof deck. Installation of metal eaves and rake edge flashings, manufactured with double-hemmed safety edges, and secured using screws at prescribed intervals that meet wind lift and manufacturer standards. Installation of metal roof panels with metal cleats secured to the roof at determined intervals (standing seam metal panels). Hand and, or mechanical seaming of standing seams between adjoining panels. Installation of accessory metal flashings such as around chimneys, walls, ridges, hips, skylights, pipe stacks, etc. Application of proper sealants and fasteners. Safety and access requirements, such as tie off points, scaffolding, etc. are also important and cost considerations when completing such work. In the field of roofing; there are fewer skilled installers of metal roofing, when compared to those that more commonly install shingles or flat roofing. This can result in higher skilled labour costs particularly in certain markets where metal roofing is generally a smaller proportion of the overall market. In other words, such skilled labour often represents a premium. For a competent do it yourself installer; that may be tackling a two sided roof with minimal protrusions, success is achievable with proper knowledge /instruction, and preparation. For anything more complex in design or detail; it is likely best left to the professional. Metal roofing can be considered a green option in the context that it is fully recycle-able, and because it has an expected lifespan of several decades. Certain metals such as copper, are known to last in excess of fifty years. In recent times, tariffs on metal producers in Canada, and global market conditions, have driven the price of metals upward of 15% over previous years. As a commodity, metals are always subject to price fluctuation, which can certainly influence the cost of metal roofing installation. When a homeowner considers the comparative cost of a metal roof system to a high grade fibreglass laminate or tri-laminate shingle installation; the case can be made that the shingle option is more cost effective, relative to comparable lifecycles of each product. Metal would certainly have an advantage over lower grade shingle products in terms of longevity. Aesthetics also plays a large role in most homeowner’s decision to select a metal roofing system versus an asphalt fibreglass roof. In Europe, such roofs tend to be more common, and so people get used to a particular appearance. Some will either like the look of a pre-manufactured metal roof, or they will not. Considering what the neighbourhood looks like in relationship to one’s home, and whether the added investment justifies the return, will be the common struggle points for many homeowners making such a decision. When one considers that metal is used to clad soffits, fascias, and often is used as a siding material; it is logical to think that metal roofing represents a valid and enduring choice for those that can afford the investment. Other advantages can include, increased fire resistance, low general maintenance and efficient lifecycle cost over time. As with any construction investment, the key is to do proper research of the product, vet competent installers, and verify with experts, the suitability of metal roofing with a proper specification, unique to the dwelling or building where the product is being utilized. What To Do If Your Roof is Leaking? What To Do if Roof Shingles Get Blown Away? How to Measure a Roof for Shingles? How to Pick Shingle Colors for Your Home?